DESTIN, Fla. — Burnt Pine Golf Club — the acclaimed Rees Jones-design at Sandestin Golf and Beach Resort on Northwest Florida’s Emerald Coast — is featured in Golfweek’s “State-by-State” rankings, which highlight premier daily-fee layouts and courses accessible via resorts. Burnt Pine is in elite company alongside several hosts to professional TOUR events and world famous resorts. Burnt Pine’s rating puts it in the upper echelon of Florida’s golf properties. Leading golfers through pine forests, wetlands and beautiful water views along the Choctawhatchee Bay, Burnt Pine is consistently cited as one of Florida’s most challenging, scenic and stunning golf experiences. The course is private, but resort guests have access and privileges by taking advantage of designated morning and afternoon tee times. Burnt Pine is one of four championship courses at Sandestin. Raven Golf Club, designed by Robert Trent Jones II, has hosted PGA Champions Tour events. 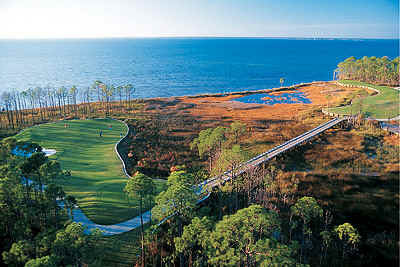 Baytowne Golf Club has five sets of tees, including a junior tee box, and is an ideal family or day of arrival course. The Links Course is the original Sandestin layout, and a longtime favorite of guests and locals. Sandestin offers a variety of packages and golf options for every level of player, from novice to professional. For more information about real estate in Sandestin, call Christina Meinen at 850.974.9704 or Andy Meinen at 850.419.4777. Sandestin Golf and Beach Resort is home to 30 charming neighborhoods featuring 1,300 condos, villas, town homes, and a wide-variety of hotel accommodations. The resort has more than seven miles of sugar white beaches and pristine bay front; four championship golf courses; 15 world-class tennis courts; 19 swimming pools; a 113-slip marina; children’s programs; fitness center and spa; 65,000 square feet of meeting space; and the Village of Baytowne Wharf, a pedestrian village featuring a host of boutique shops, casual and fine dining restaurants, nightlife and events. Sandestin is a member of Visit South Walton, an unparalleled strand of 15 distinct beach neighborhoods. Sandestin is also the host of the ANNIKA & Friends Event and ProAm this May. Getting There: Northwest Florida Beaches International Airport (ECP) offers direct flights from Houston, Baltimore/Washington DC, Atlanta, Orlando, Nashville, and Memphis. Northwest Florida Regional Airport (VPS) offers direct flights from Atlanta, Dallas, Houston and Charlotte. Service from Washington, DC begins in March.